A fracking well explodes, killing a worker, and a fire burns for days. Read Chevron’s nifty solution for the neighbors. 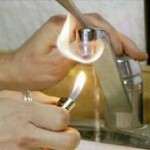 Is hydro-fracking a nuclear meltdown for the water supply? This environmental journalist says so.